Over Pakistani Objections, U.S. Resumes Drone Strikes : The Two-Way The strike, which killed three suspected militants on Sunday, was carried out despite the recent demand from Pakistan's parliament that such actions be suspended. 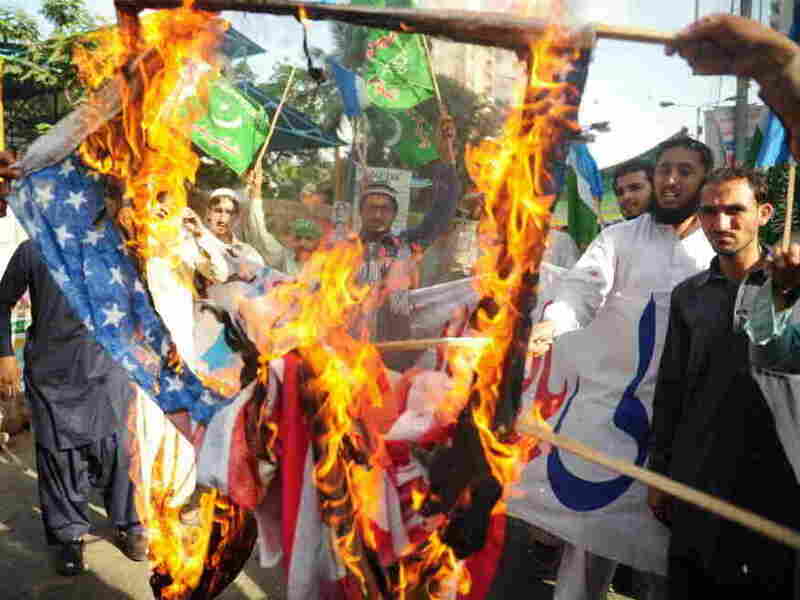 April 13: In Karachi, activists from the Shabab-e-Milli group set fire to U.S. flags during a protest against the reopening of the NATO supply route to Afghanistan. "CIA drone missiles hit militant targets in Pakistan on Sunday for the first time in a month, as the United States ignored the Pakistani government's insistence that such attacks end as a condition for normalized relations between the two perpetually uneasy allies," The Washington Post writes. "Pakistan's prime minister struck a moderate tone Monday amid criticism of the U.S. for carrying out its first drone strike in the country since parliament demanded that Washington end the attacks two weeks ago. "When asked about the most recent strike, which killed three suspected Islamist militants Sunday, Gilani pointed out that the resolution passed by parliament also stipulated that foreign fighters must be expelled from the country and Pakistani soil should not be used to attack other countries.
" 'So, when we plan a strategy (with the U.S.), all these aspects would be discussed,' said Gilani." "The C.I.A. strike underlined the tensions between American diplomatic and security priorities in Pakistan. Officials from the two countries are trying to reset relations that stalled badly after American warplanes killed 24 Pakistani soldiers along the Afghanistan border in November."